Definition at line 40 of file llviewerassetstorage.h. Definition at line 42 of file llviewerassetstorage.cpp. Definition at line 49 of file llviewerassetstorage.cpp. 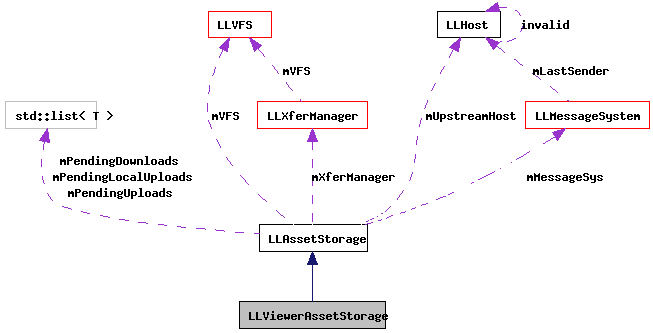 Definition at line 162 of file llviewerassetstorage.cpp. References LLFile::fopen(), gAgent, LLAgent::getSecureSessionID(), LLAssetStorage::legacyStoreDataCallback(), LL_ERR_CANNOT_OPEN_FILE, LL_EXSTAT_BLOCKED_FILE, llendl, llerrs, llinfos, LLAssetType::lookup(), LLTransactionID::makeAssetID(), LLLegacyAssetRequest::mUpCallback, LLLegacyAssetRequest::mUserData, LLAssetStorage::mVFS, LLFile::remove(), S32, LLVFile::setMaxSize(), size, storeAssetData(), LLVFile::write(), and LLVFile::WRITE. Definition at line 56 of file llviewerassetstorage.cpp. References _PREHASH_AssetBlock, _PREHASH_AssetData, _PREHASH_AssetUploadRequest, _PREHASH_StoreLocal, _PREHASH_Tempfile, _PREHASH_TransactionID, _PREHASH_Type, LLMessageSystem::addBinaryDataFast(), LLMessageSystem::addBOOLFast(), LLMessageSystem::addS8Fast(), LLMessageSystem::addUUIDFast(), gAgent, LLVFS::getExists(), LLVFile::getLastBytesRead(), LLAgent::getSecureSessionID(), LLVFile::getSize(), LLHost::isOk(), LL_ERR_ASSET_REQUEST_FAILED, LL_ERR_ASSET_REQUEST_NONEXISTENT_FILE, LL_ERR_CIRCUIT_GONE, LL_EXSTAT_NO_UPSTREAM, LL_EXSTAT_NONEXISTENT_FILE, LL_EXSTAT_VFS_CORRUPT, llendl, llinfos, llwarns, LLAssetType::lookup(), LLTransactionID::makeAssetID(), LLAssetRequest::mDataSentInFirstPacket, LLAssetStorage::mMessageSys, LLAssetStorage::mPendingUploads, MTUBYTES, LLAssetRequest::mUpCallback, LLAssetStorage::mUpstreamHost, LLAssetRequest::mUserData, LLAssetStorage::mVFS, LLMessageSystem::newMessageFast(), LLMessageSystem::nextBlockFast(), LLVFile::read(), LLVFile::READ, S32, LLMessageSystem::sendReliable(), and TRUE.